This three-piece center by Studio Designs provides a comfortable work space and keeps your supplies easily accessible. The table top is adjustable up to 40 degrees and includes a 24-inch pencil ledge that slides up and locks into place when needed. Complete any office or work area with this durable and stylish black stool and white drafting table, featuring three drawers and one convenient storage shelf for easy storage. 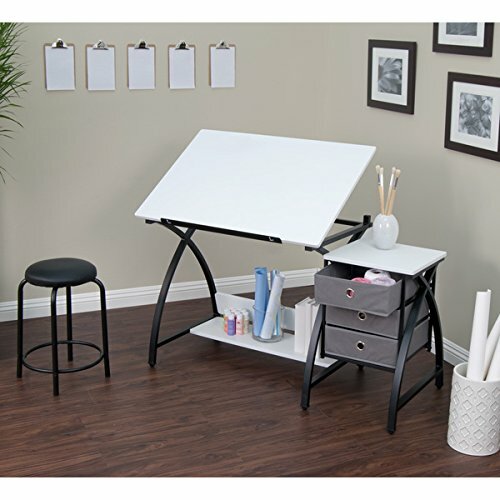 With a large surface area for working and a comfortable stool height of 20.5 inches, this drafting table is a great addition to any area.